Based on the book by historian Stephen Ambrose, this ten part series, at £87 million the most expensive TV production ever, follows the US 101st Airborne Division`s E `Easy` Company from initial training through operations involving D-Day, Market Garden and the Battle Of The Bulge across Holland, Belgium, Germany and Austria until the end of the war. I have waited for 12 months to buy this DVD and the price wouldn`t put me off in the slightest. After watching the series on BBC, I was absolutley compelled and had to buy the DVD, which I did last week, and found it was even better. Presented in a metallic tin box, and with loads of features and documentaries, this is a must buy series. If you`re thinking of buying it, do it now, because after these tin boxes sell out, they will sell in a normal cardboard box, which doesn`t do it justice. Fantastic. You can really indentify with the characters, and the Spielberg maic is evident. 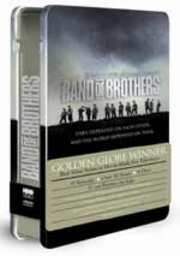 If there is one DVD you will buy this year, make it Band of Brothers. Where to start with a title this good? Ok, the discs (six of them) come in a metal presentation box, if you get in late you may end up with the cardboard case as these are aparently limited in numbers, not the end of the world but it`s nice to get the metal. Anyways, on to the discs themselves. The Discs are presented in 1.78:1 Widescreen and the picture quality is very good, the whole series seems to have a greenish/greyish tint to the colouring, this insures that WWII `look` to the proceedings, similar to SPR. Its very good to look at and adds atmosphere to the great war footage. Sound is 5.1 Dolby Digital and does it`s job, it does not seem as good as SPR but it`s more than adequate. As i presume everyone knows the series tracks the lives and trials of E company (easy) throughout thier entry in to the war on june 6th 1944. Disc one is an intro to the guys in the unit and takes you through basic training with them. Here we meet David Shwimmer (Ross geller, friends) he plays the part of captain Soble and in my opinion is miscast in this role. Soble was a domineering, slightly sadistic officer and Shwimmer try`s to portray this but it falls slightly short simply because he`s Ross. I think he was cast because Spielberg/Hanks tried to recruit actors who looked like the real Easy company men, Shwimmer DOES look like the real Captain Soble. Thankfully, after the first episode you wont get to see to much of him. Each disc moves the story along at a good pace, each story, at times, will focus on a different character in E company. The Battle of the Bulge episodes are particularly good imo, the battle scenes in Bastogne are simply awe inspiring, this was all filmed inside believe it or not, it looks damn cold. Very well done. Some characters are hard to keep track of, (theres so many) the story flicks around at times and you may lose track, this i think will be better second time around, as i will know who to look for. All in all the whole series is top notch. I cant level any serious criticisim`s at it. I have to say it`s a definate keeper and i can`t wait to watch it again. Yes, all six discs!!!!! You get an extras disc (disc six) This includes an 80 min documentary, about thereal E company men, here you will meet some of the surviving members of the unit and the real Major Winters, played so convincingly by british actor Damien Lewis. So, get this box set, NO question. You will see where the 87 million dollars were spent. It is a must have for any DVD collection and i cannot praise it highly enough.